Here is the list of the hotels near Saint-Yzans-de-Médoc. Book your hotel near Saint-Yzans-de-Médoc today, Thursday 16 May for the best price, reservation and cancellation free of charge thanks to our partner Booking.com, leader in on-line hotels reservation. Below here is the list the 50 closest hotels of Saint-Yzans-de-Médoc, sortable according your criteria. You will find the position of these accommodations on the Saint-Yzans-de-Medoc hotels map. Located in Ordonnac, Le Clos de la Palmeraie offers B&B accommodation in the heart of the Médoc vineyards. It features a garden, a private swimming pool and access to a spa, sauna and massages, at an extra cost. All the rooms are individually decorated, following a country or a region theme. They all feature an en suite bathroom with free toiletries, hairdryer, bathrobe and shower. Every morning, guests can enjoy a continental breakfast at the B&B. Guests can sample exotic food prepared by the host, upon reservation. Free Wi-Fi and free private parking are provided. Guests can visit the Médoc Castles in the area or drive 30 km to the Atlantic beaches. Lesparre-Médoc Train Station is 9 km away, while Bordeaux-Mérignac Airport is 67 km away. Set in Ordonnac in the Aquitaine Region, this detached holiday home features a terrace and a garden. Guests benefit from balcony. Free private parking is available on site. The kitchen features an oven and a microwave and there is a shared bathroom. A plancha grill is available and guests can dine outside, in the covered patio. Towels and bed linen are available in this holiday home. Mamina features free WiFi . You can play table tennis and darts at the property, and free use of bicycles is available. Royan is 38 km from Mamina, while Saint-Palais-sur-Mer is 42 km away. The nearest airport is Mérignac Airport, 54 km from the property. Set in the Haut Médoc vineyards, 500 metres from the Gironde estuary and a 30-minute drive from the beaches, La Cadournaise offers bed and breakfast accommodation with free Wi-Fi. A continental breakfast is served every morning, in the garden whenever possible. Some bars and restaurants can be found a 5-minute drive away. All rooms have a bathroom with shower and hairdryer, an electric kettle, seating area, wardrobe, books, magazines, glasses and bottle opener. Saint Estèphe is less than 10 minutes’ drive from La Cadournaise, while Pauillac and Lesparre are a 15-minute drive away. There is free parking at the property. La demeure Bournac is located in Civrac-en-Médoc. Complimentary WiFi is featured. The holiday home is composed of a dining area, a fully equipped kitchen, and 4 bathrooms. A flat-screen TV is provided. Lacanau is 48 km from the holiday home. The nearest airport is Mérignac Airport, 70 km from La demeure Bournac. Located in Saint-Seurin-de-Cadourne in the Aquitaine region, Le Gite à Nano features a terrace and garden views. The property, housed in a building dating from 19th century, provides free WiFi. This 2-bedroom holiday home includes 2 bathrooms equipped with a bath and a bidet. There is a seating area and a kitchen complete with a dishwasher and an oven. The holiday home offers a barbecue. Guests can also relax in the garden or on the shared lounge area. Blaye is 33 km from Le Gite à Nano, while Soulac-sur-Mer is 43 km away. The nearest airport is Mérignac Airport, 64 km from the property. Set in Ordonnac, Ferienhaus mit Pool Ordonnac 100S offers accommodation with a private pool and free WiFi. Guests staying at this holiday home have access to a fully equipped kitchen. The holiday home is equipped with a TV. Lacanau is 46 km from the holiday home. Mérignac Airport is 64 km away. Country House Lieu Dit Pipeyrat is located in Saint-Germain-dʼEsteuil and offers barbecue facilities. Guests can enjoy the free WiFi. This villa is fitted with 5 bedrooms, a satellite TV, and a kitchen. The villa offers an outdoor pool. Lacanau is 47 km from Country House Lieu Dit Pipeyrat. Mérignac Airport is 63 km from the property. Located in Bégadan, Ferienhaus Bégadan 101S offers air-conditioned accommodation with a terrace and free WiFi. The accommodation is 48 km from Royan. The holiday home includes 2 bedrooms and a kitchen with a dishwasher and a coffee machine. Lacanau is 49 km from the holiday home, while Blaye is 45 km away. Mérignac Airport is 72 km from the property. Ferienhaus Begadan 100S is set in Bégadan. This holiday home also has free WiFi. The holiday home includes 2 bedrooms and a kitchen with an oven and a coffee machine. Royan is 48 km from the holiday home. The nearest airport is Mérignac Airport, 72 km from the property. Ferienhaus Begadan 110S is situated in Bégadan. Guests are welcome to enjoy the free WiFi. The holiday home includes 2 bedrooms and a kitchen with a dishwasher and a coffee machine. A TV is featured. Royan is 47 km from the holiday home, while Blaye is 46 km away. The nearest airport is Mérignac Airport, 77 km from Ferienhaus Begadan 110S. Featuring free WiFi, a tree-filled park and an outdoor swimming pool, Chateau Haut Baron offers accommodation in Saint-Estèphe, in the heart of St Estèphe Medoc vineyards, 10 km from Pauillac, and a 40-minute drive from the Atlantic Ocean beaches. Free private parking is available on site. The rooms have a flat-screen TV. Certain units have a seating area for your convenience. Rooms are equipped with a private bathroom. Extras include free toiletries and a hair dryer. Mérignac is 50 km from Chateau Haut Baron. Mérignac Airport is 49 km from the property. Offering a seasonal outdoor swimming pool, a children’s playground, a laundry and free bikes, La Caleche is located in Bégadan. Free Wi-Fi access is available throughout. The bedrooms have a private bathroom with shower and a flat-screen TV. The cottages also come with a fully equipped kitchen including kitchenware. Some cottages even have a dishwasher. In the morning, a continental breakfast is served. An array of activities can be enjoyed on site or in the surroundings, including cycling, hiking and table tennis. Guests can also visit castles and taste wine 800 metres away. La Caleche is located 30 km from Pointe du Verdon and Pauillac, while Bordeaux is 60 km away. Lesparre-Médoc Train Station is 8 km away and there is free on-site parking. Hotel Rollan de By features bright and spacious en suite rooms with sofas, flat-screen TV and free Wi-Fi internet access. It has a lovely terrace that overlooks the garden. Rollan de By is located in the village of Begadan in heart of Médoc. It is 5 km from the Gironde estuary that is formed where the Dordogne and Garonne Rivers meet. Bordeaux is an hour's drive away. Private parking is free for all guests at Hotel Rollan de By. Montalivet and Hourtin beaches are 30 km from the hotel and Lacanau is 50 km away. Wine tasting can be organised on site. Ferienhaus Civrac-en-Medoc 110S is situated in Civrac-en-Médoc. The accommodation has free WiFi. The holiday home includes 2 bedrooms, a kitchen with a dishwasher and an oven, as well as a coffee machine. Royan is 48 km from the holiday home. Mérignac Airport is 67 km away. Set in an 18th-century wine-making château, this B&B is 2 km from the centre of Saint-Estèphe, in the wine region of Médoc. It offers free Wi-Fi in all the rooms and a swimming pool that is open from June to September. All the heated and air-conditioned rooms at Château Ormes de Pez offer garden views and a flat-screen TV. A private bathroom with a bath or shower and free toiletries is also provided. A guest laundry is available on site. Breakfast is prepared using fresh products and served every morning at Château Ormes de Pez. Upon request guests can arrange to try seasonal dishes served by the hosts. This B&B is 10 km from Pauillac and 60 km from Bordeaux. Free private parking is available on site. Ferienhaus Lesparre 200S is situated in Lesparre-Médoc. Guests staying at this holiday home have access to free WiFi. The holiday home includes 2 bedrooms, a kitchen with a dishwasher and an oven, as well as a coffee machine. Royan is 49 km from the holiday home, while Lacanau is 44 km from the property. The nearest airport is Mérignac Airport, 62 km from the property. Featuring barbecue facilities, In Medio Aquae features accommodation in Saint-Estèphe with free WiFi and river views. Housed in a building dating from 1900, the holiday home is in an area where guests can engage in activities such as cycling, fishing and hiking. Offering 2 bedrooms and 1 bathroom with a shower, this holiday home is equipped with a flat-screen TV. There is a seating area, a dining area and a kitchen equipped with a dishwasher. Guests can relax in the garden at the property. Blaye is 29 km from the holiday home. The nearest airport is Mérignac Airport, 60 km from In Medio Aquae. Situated in Bégadan, Les Chambres d'Hôtes de Château Vieux Robin offers accommodation with free WiFi and a garden with a terrace and garden views. There is a private bathroom with bidet in all units, along with free toiletries and a hair dryer. A continental breakfast can be enjoyed at the property. Guests can also relax in the shared lounge area. Royan is 48 km from the bed and breakfast. The nearest airport is Mérignac Airport, 72 km from the property. Providing a seasonal outdoor swimming pool, Le Clos De La Vignerie features accommodation in Saint-Estèphe. Free WiFi is featured. Each unit offers a fully equipped kitchenette, a flat-screen TV, a living room with a sofa, and a private bathroom. Some units feature a seating area and/or a terrace. Guests at the apartment can enjoy a continental breakfast. Guests at this property can enjoy cycling nearby, or make the most of the garden. Lacanau is 50 km from Le Clos De La Vignerie, while Blaye is 28 km from the property. Mérignac Airport is 59 km away. Bed and Breakfast Civrac-en-Médoc Preferred hotel ! Chambres d'Hôtes Château Pierre de Montignac are set in the Château Pierre de Montignac, a famous AOC Médoc wine property, 33 km from Royan. Free WiFi is provided throughout the property which spreads over 25 hectares and free private parking is available on site. You will find a coffee machine and a kettle in the room. All rooms are equipped with a flat-screen TV and a private bathroom with a bath or shower. You will find a shared kitchen at the property, as well as a barbecue and sun terrace. A selection of activities are offered in the area, such as cycling and fishing. Saint-Palais-sur-Mer is 37 km from Chambres d'Hôtes Château Pierre de Montignac, while Lacanau is 42 km from the property. The nearest airport is Mérignac Airport, 59 km from the property. Set in an 18th-century castle, Chateau Le Souley is a guest house located in Vertheuil-en-Médoc, a 10-minute drive from Pauillac in the heart of Médoc vineyards. It is surrounded by a 3-acre tree-filled park with an outdoor swimming pool. Viewing the garden, all rooms at Chateau Le Souley include a desk and an en suite bathroom. A shared lounge is available as well as free WiFi access in common areas. Breakfast is served daily. Upon prior request, guests can share evening meals at the owner table and wine tasting can be enjoyed nearby. Pauillac Train Station is located just 5 km from Chateau Le Souley and Bordeaux-Mérignac Airport is 55 km away. Situated in Vertheuil-en-Médoc on the Medoc wine route, between Pauillac and Saint-Estèphe, between the estuary and the ocean, Les Arums de Fondeminjean features a seasonal outdoor pool and sun terrace. Certain units include views of the pool or garden. Rooms are fitted with a private bathroom equipped with an Italian shower and separate toilet. They also have a private terrace. Upon prior request, guests can share a meal at the owner's table. Breakfast is served daily and includes jams, yogurts, and homemade cakes served along the pool weather permitting. A number of activities are offered in the area, such as cycling and hiking. Royan is 45 km from Les Arums de Fondeminjean, while Bordeaux is 50 km away. Mérignac Airport is 48 km from the property. The Tour Hôtel is located in the heart of the Medoc, in Gironde, 2 km from the centre of Lesparre-Médoc. It offers en-suite guestrooms with satellite TV and free Wi-Fi internet access. The Tour Hôtel serves a daily continental buffet breakfast. Guests of the Tour Hôtel can enjoy hiking, cycling and sailing, or visit the Atlantic beaches or the Hourtin Lake. Free private parking is available on site for guests exploring the region’s Medoc vineyards by car. With a seasonal outdoor swimming pool, free bikes, a hot tub and a sauna, Château La Gravière offers bed and breakfast accommodation in La Gravière, 1 km from Vertheuil-en-Médoc. Free Wi-Fi is available. The bedrooms at the former wine-making property are soundproofed. Each features an en suite bathroom with bath or walk-in shower and separated toilet. They have a view of the pool or park and guests can enjoy a shared lounge. At Château La Gravière, breakfast consists of homemade cakes, homemade jams, pastries, hot beverages, seasonal fruit and fruit juices. It is possible to share evening meals with the owners, made using mainly seasonal and local produce. Meals have to be booked at least 48 hours in advance. Pauillac Train Station is 10 km from the property, while Bordeaux Mérignac Airport is 55 km away. Guests can enjoy hiking and cycling in the surroundings and there is free parking on site. Located in Lesparre-Médoc, Domaine du Papillon features accommodation with free WiFi and seating area. Each unit comes with a sofa, a flat-screen TV with satellite channels, a well-fitted kitchen and a private bathroom with shower. Some units feature a dining area and/or a terrace. A continental breakfast is served daily at the property. The bed and breakfast offers a fitness centre. Guests can go cycling or hiking or relax in the garden. Royan is 45 km from Domaine du Papillon, while Lacanau is 42 km away. Mérignac Airport is 64 km from the property. Situated in Lesparre-Médoc, Arc en ciel provides accommodation with a terrace and free WiFi. Guests staying at this holiday home have access to a fully equipped kitchen. The holiday home includes 3 bedrooms and a living room with a flat-screen TV. Royan is 45 km from the holiday home, while Lacanau is 41 km away. Mérignac Airport is 64 km from the property. Gite en medoc is situated in Saint-Germain-dʼEsteuil. The holiday home is in an area where guests can engage in activities such as cycling and hiking. This holiday home is equipped with a kitchen with a dishwasher and a microwave, a flat-screen TV, a seating area and 1 bathroom with a shower. The holiday home offers a barbecue. A children's playground and a sun terrace are available for guests at Gite en medoc to use. Lacanau is 43 km from the accommodation. Mérignac Airport is 58 km from the property. Featuring garden views, La Halte de Segondignac in Saint-Germain-dʼEsteuil provides accommodation and a garden. Free WiFi is featured. The units have a fully equipped kitchenette with dining area, a microwave, kettle, and a fridge. There is a private bathroom with shower and free toiletries in each unit, along with a hair dryer. A continental breakfast is available every morning at the property. The bed and breakfast offers a terrace. Hiking can be enjoyed nearby. Lacanau is 43 km from La Halte de Segondignac. The nearest airport is Mérignac Airport, 58 km from the property. Apartment Lesparre-Médoc Preferred hotel ! Appartements tourisme meublés Com'in Médoc offers pet-friendly accommodation in Lesparre-Médoc, at an equal distance to Médoc region's wine properties and beaches. Free WiFi is provided and free private parking is available on site. All apartments have a kitchen, equipped with an oven, a microwave, and a toaster. Guests have access to a shared terrace with garden furniture. A TV is provided in each apartment. Lesparre-Médoc train, bus and taxi station is a few meters away. A supermarket and a fishmonger's can be found 800 metres away. Soulac-sur-Mer is 30 km from Appartements tourisme meublés Com'in Médoc. Mérignac Airport is 56 km away. Ferienhaus Gaillan-en-Medoc 120S is set in Gaillan-en-Médoc. Guests may enjoy free WiFi. The holiday home has 3 bedrooms, a living room, and a kitchen with a dishwasher. Royan is 44 km from the holiday home. The nearest airport is Mérignac Airport, 65 km from the property. Ferienhaus Gaillan-en-Médoc 140S is set in Gaillan-en-Médoc. The accommodation is 35 km from Royan. The 4-bedroom holiday home is fitted with a kitchen with a dishwasher, and a bathroom with a bath and a washing machine. A TV is featured. Saint-Palais-sur-Mer is 38 km from Ferienhaus Gaillan-en-Médoc 140S, while Lacanau is 39 km away. Mérignac Airport is 57 km from the property. Ferienhaus Gaillan-en-Medoc 100S is located in Gaillan-en-Médoc. This holiday home offers accommodation with free WiFi. The holiday home has 3 bedrooms and a fully fitted kitchen with a dishwasher and an oven. Royan is 44 km from the holiday home, while Saint-Palais-sur-Mer is 49 km away. Mérignac Airport is 65 km from the property. Ferienhaus Gaillan-en-Medoc 110S is set in Gaillan-en-Médoc. Guests may enjoy free WiFi. The holiday home includes 3 bedrooms and a kitchen with a dishwasher and a coffee machine. Royan is 44 km from the holiday home. The nearest airport is Mérignac Airport, 65 km from the property. Located 20 km from Hourtin Lake and 55 km from Bordeaux, Le Fournil Du Mirail is a guest house offering soundproofed bedrooms and free Wi-Fi in all rooms. The rooms are modern and are located on the ground floor with access to a private terrace. They have large bay windows, a flat-screen TV and a shower room with hairdryer. In the morning, a hearty breakfast of homemade pastries and jams is served. Pauillac Train Station is 8 km from Le Fournil Du Mirail and Château Margaux vineyards are 30 km away. There is free on-site parking. Ferienhaus mit Pool Cissac-Médoc 100S is located in Cissac-Médoc. Guests have access to free WiFi. The holiday home includes 3 bedrooms and a kitchen with a dishwasher and an oven. Lacanau is 45 km from the holiday home. The nearest airport is Mérignac Airport, 55 km from the property. Bed and Breakfast Saint-Thomas-de-Cônac Preferred hotel ! Set in Saint-Thomas-de-Cônac, Chez Brown features accommodation with free WiFi and a garden with an outdoor swimming pool and pool views. There is a seating and a dining area in all units. A continental breakfast is available daily at the property. The bed and breakfast offers a barbecue. Guests at the property can enjoy tennis on site, or cycling in the surroundings. Royan is 44 km from Chez Brown. The nearest airport is Mérignac Airport, 93 km from the property. Boasting barbecue facilities and a garden, Chateau Calmeyrac provides accommodation in Gaillan-en-Médoc with free WiFi and garden views. Guests staying at this holiday home have access to a terrace. The property includes a living room with a flat-screen TV. A dishwasher, an oven and a microwave can be found in the kitchen. Royan is 40 km from the holiday home. The nearest airport is Mérignac Airport, 68 km from Chateau Calmeyrac. Located in Saint-Bonnet-sur-Gironde in the Poitou-Charentes Region, 42 km from Royan, Les Glycines features a seasonal outdoor pool and views of the garden. Free private parking is available on site. The room and the apartment are both equipped with a private bathroom with a shower. Les Glycines features free WiFi throughout the property. A TV is provided. You can engage in various activities, such as cycling and fishing. The bed and breakfast also offers free use of bicycles. Saintes is 43 km from Les Glycines, while Cognac is 46 km from the property. Jonzac thermal baths are a 25 minutes drive away. Mérignac Airport is 58 km away. Situated in Saint-Thomas-de-Cônac, 39 km from Royan, Domaine de l'Estuaire boasts a sun terrace and views of the river. Free WiFi is provided throughout the property and free private parking is available on site. Every room has a private bathroom fitted with a shower. In the morning, a vegetarian breakfast is served. Evening meals can be served upon prior request. You will find a shared lounge at the property. Domaine de l'Estuaire is certified Ecolabel, a European certification for eco-friendly properties. You can play tennis and table tennis at this bed and breakfast. The area is popular for horse riding and cycling. The bed and breakfast also offers free use of bicycles. Saintes is 41 km from Domaine de l'Estuaire, while Cognac is 44 km from the property. Mérignac Airport is 62 km away. Located in the Médoc wine region, 3 km from Gaillan-en-Médoc and a 20 minute drive to the Atlantic coast, this hotel is in a 19th-century manor house, surrounded by landscaped gardens. Gourmet French cuisine is served in the hotel’s restaurant. Decorated with antique furniture and offering views of the gardens, the air-conditioned guest rooms are equipped with a flat-screen TV and en suite bathrooms with free toiletries. Some rooms have free Wi-Fi internet access. A continental breakfast is served each morning at the hotel in the elegant dining room. Regional dishes accompanied by local wines are served in the restaurant and when the weather is nice you can enjoy meals on the terrace. Paddle tennis facilities are available at the hotel and during their stay guests are invited to wander through the gardens, which feature a pond and fountain. Additional facilities provided on site include free private parking. Hotel Les Vieux Acacias is located in the famous wine-growing region of Médoc, near the road leading to the prestigious châteaux. The sea is just a 15-minute drive away and its rooms have shower or bath, satellite TV, garden views and free Wi-Fi internet access. The family-run Hotel Les Vieux Acacias has a large tree-shaded terrace and a colourful flower garden. Some rooms have a balcony and there is also an outdoor swimming pool. Hotel Les Vieux Acacias serves a daily breakfast in the dining room or on the shaded terrace. A restaurant can be found 150 metres away and picnics are possible. Nearby, you will find the Saint Hillaire Castle. The SNCF Lespare train station is just 13 km away and the Royan ferry boat is just 25 km away. Free private parking is possible on site. Located in Queyrac, Le Fief de la Ribeyre features accommodation with free WiFi and access to a garden. The bed and breakfast offers a flat-screen TV and a private bathroom with free toiletries, a hair dryer and shower. A fridge and kettle are also offered. A continental breakfast is served daily at the property. At Le Fief de la Ribeyre guests are welcome to take advantage of a hot tub. Guests at the property can enjoy table tennis on site, or hiking in the surroundings. Royan is 39 km from the accommodation. The nearest airport is Mérignac Airport, 72 km from Le Fief de la Ribeyre. Guest accommodation Jau-Dignac-et-Loirac Preferred hotel ! Set in a charming house in Le Port de Richard, Domaine des Prés de Joussac features a garden and terrace. It is located on the Médoc wine route, 1 km from the Gironde estuary. Some accommodation offers stone walls, a TV and en suite bathroom. The cottages include living areas with a library and fully equipped kitchens. For guests staying in a guest room in the B&B, a homemade breakfast is served in the living room or on the terrace. The Médoc Vineyards are situated just 1 km away and Soulac Abbey is just a 30-minute drive from the property. Richard Lighthouse is 4.2 km away. Guests can also explore the region from a hot air balloon or by boat. Free visit and tasting of a Médoc Cru Bourgeois wine can be organised. Free WiFi access is available in the entire property and free private parking is possible on site. Offering free WiFi and garden views, chateau queyrac is an accommodation located in Queyrac. This holiday home has a garden. The holiday home includes 2 bedrooms and a living room with a flat-screen TV. The holiday home also includes 2 bathrooms with a bath. Royan is 38 km from the holiday home. The nearest airport is Mérignac Airport, 72 km from the property. Set in Queyrac, 29 km from Royan and 15 minutes' drive from Soulac-sur-Mer, Château Saint-Roch features free WiFi access and free private parking. Every room has a flat-screen TV. Certain rooms have a seating area where you can relax. There is a shared lounge at the property. Saint-Palais-sur-Mer is 32 km from Château Saint-Roch, while Lacanau is 44 km away. The nearest airport is Mérignac Airport, 63 km from Château Saint-Roch. Located in Queyrac, Le Manoir Lacustre offers an outdoor swimming pool, BBQ facilities, table tennis and a large park. Montalivet Beach is just a 12-minute drive away. All guest rooms are soundproofed. Traditional restaurants can be found within 300 metres from the property. Additional features include massage treatments and bicycle rental, all at an extra cost. Soulac-sur-Mer is a 20-minute drive away and the property is set on the Wine Route. Ferienhaus Naujac-sur-Mer 120S is located in Naujac-sur-Mer. This holiday home features accommodation with free WiFi. The holiday home includes a kitchen with a dishwasher and an oven, as well as a coffee machine. A TV is featured. Lacanau is 35 km from the holiday home, while Blaye is 42 km from the property. The nearest airport is Mérignac Airport, 65 km from the property. Situated in Mirambeau in the Poitou-Charentes region, Gîte Rural de Trémont features a terrace and garden views. Guests staying at this holiday home have access to a fully equipped kitchen. 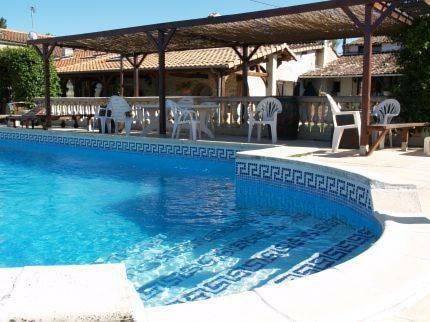 Composed of 3 bedrooms and 2 bathrooms with a shower, this holiday home features a satellite flat-screen TV. Jonzac is 24 km from the holiday home, while Blaye is 31 km from the property. The nearest airport is Mérignac Airport, 84 km from Gîte Rural de Trémont. Holiday Home St Fort sur Gironde I is set in Saint-Romain-sur-Gironde. Free WiFi is featured. This holiday home comes with 2 bedrooms, a living room and a fully equipped kitchen with a dishwasher and a microwave. A TV is available. Royan is 38 km from the holiday home, while Saintes is 42 km from the property. The nearest airport is Mérignac Airport, 98 km from Holiday Home St Fort sur Gironde I.
Ferienhaus Queyrac 100S is set in Queyrac. Guests staying at this holiday home have access to a fully equipped kitchenette. Royan is 36 km from the holiday home, while Saint-Palais-sur-Mer is 41 km away. The nearest airport is Mérignac Airport, 73 km from Ferienhaus Queyrac 100S. Below here is the hotels map of Saint-Yzans-de-Médoc. Names and details of Saint-Yzans-de-Médoc hotels can be shown on the map clicking on the prices icons.